If building your own home has always been your dream, but the lack of cash has turned it into a unlikely reality, then take a cue from Mattel industrial designer Debbie Glassberg who built her 2,600 square feet container home out of five Chinese shipping containers. Located in Kansas City, this extraordinary dwelling has everything she and her family needs for fine living, with a lot of extra space and natural light to spare. Jump ahead for a look into the nouveau dwelling's chic and retro interiors! In the world of sustainable architecture and affordable living, shipping container homes are a great solution for the budget-minded seeking a low-maintenance and eco-friendly living situation — and Glassberg’s house is no exception. As you enter the residence, an open-plan living room featuring a collection of re-upholstered vintage furniture surprises the eyes with an unmatched style. The palette of turquoise provides the room with an uplifting feeling, making the interior shine. The elegant dinning room features floor-to-ceiling windows dressed with white translucent curtains. This allows natural light to permeate the room, while revealing the magnificent tree silhouettes behind. The residence also boasts another green delight with a modest vegetable patch set right at the front door. More space is allocated to growing vegetables on the rooftop, which can be easily accessed through the top floor rooms. And if you don’t want to head up top, an outside porch area provides the perfect place to lounge and spend long summer day outdoors with a drink in hand. Back inside the house, a white narrow kitchen is equipped with energy efficient appliances and large windows. On the top floor sits two bedrooms, an office and a bathroom. 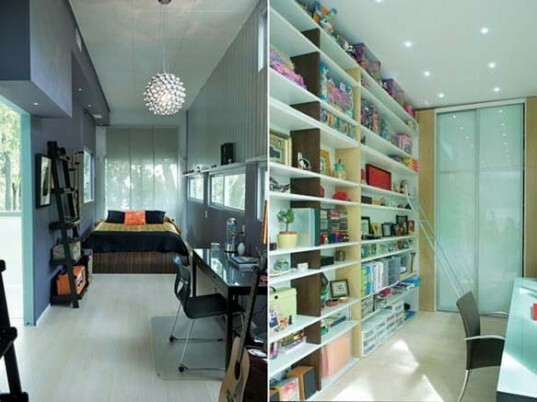 The smaller bedroom is where, Debbie’s son sleeps and the office space features an extensive built-in shelving system designed for Debbie to showcase all her toy designs for Mattel. The master bedroom was built using two containers and is as light and airy as the rest of the home. As a contrast to the rest of the house, the spare room has been painted bright red and features an oriental style decor. For anyone interested in creating one of these beauties for themselves, the good news is that Debbie will be constructing homes for anyone interested in a simpler, less expensive and creative way to live. Wow, what a wonderful ideal and gree too using shipping containers for a home. Cool and recyclable is the word! Great ideal and thanks for sharing. Outstanding! Most every example of using ISBUs involves opening up all the units and the structural modifications negate any cost savings that could be achieved. This house shows creative ways to use the narrow long spaces and it comes off well leaving the strength of the units intact. As you enter the residence, an open-plan living room featuring a collection of re-upholstered vintage furniture surprises visitors with style. 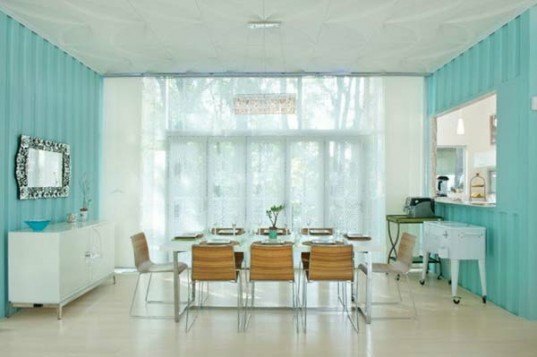 The chosen shades of turquoise provide the room with an uplifting feeling, making the room shine. The elegant dinning room features floor-to-ceiling windows dressed with white translucent curtains. This allows ample natural light to come in, while revealing the magnificent tree silhouettes behind. Apart from being a house entirely made from repurposed containers, the green nature of the project is portrayed right at the entrance door featuring a modest front garden vegetable patch. But this is not the only space allocated for growing vegetables, a long rooftop edible garden, with easy access from the top floor rooms, is already growing fast. An outside porch sitting area is the perfect place to spend long summer day outdoors. Back inside the house a white narrow kitchen has been equipped with energy efficient appliances and large windows. On the top floor there are 2 bedrooms, an office and a bathroom. The master bedroom was built using two containers. The master bedroom's bathroom was covered in Venetian glass tiles - easy to keep clean and complimenting the marine shades chosen for the rest of the home. As a contrast to the rest of the house, a bright red spare room is the place for entertaining friends and watch TV, in an oriental styled atmosphere. It all started with a few piled containers that after three years of hard work, insulation and love, became a family home.